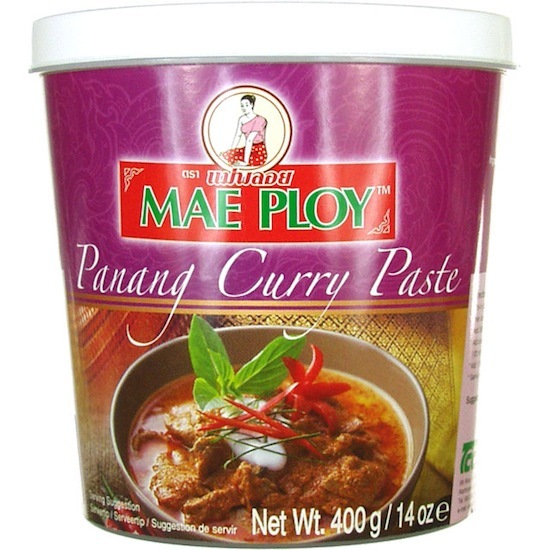 We love Thai food and I can make a pretty good Indian Curry but wasn’t having much luck with Thai curry until I found Mae Ploy brand curry pastes in our local Asian Market. They are inexpensive, $2.50 or so each and each container will make many curries as you only need a tablespoon or two if you like it really spicy. All the other varieties have similar ingredients. You can make a super easy curry dinner. I just pour one can of Organic Coconut milk into a bowl and add one tablespoon of curry paste and whisk for a few minutes until blended. Then I take a large sauté pan, and in 1 tablespoon or so of coconut oil I sauté whatever vegetables I have on hand. Onion, broccoli, cauliflower, carrots, eggplant – any vegetable will work. If you are using meat or chicken you can sauté it before the veggies to get it cooked, put it on a plate and then start the veggies. If you are using fish or beans or leftover cooked meat, cook the veggies first and then add. I will sometimes add frozen shrimp as they’ll cook really fast. So, once your veggies are partially cooked pour in the coconut milk/curry paste mixture and add your cooked meat/raw fish/frozen shrimp/cooked beans – whatever you’re using and let it simmer until done, usually around 10-20 minutes. 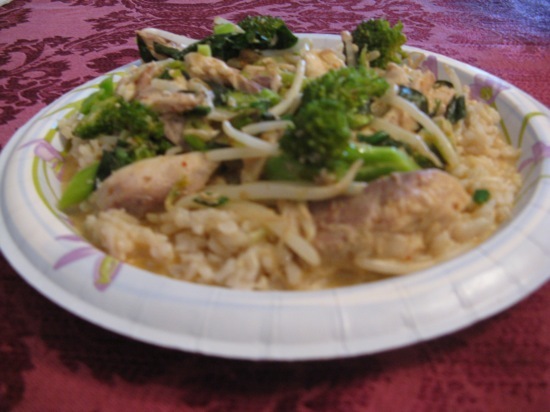 Serve with organic brown rice if you’re eating grain. I just have mine with a heaping tablespoon of organic Greek yogurt on the side. Delicious! Amazon carries the brand, a link is below, but if you have an Asian store near you, you can buy many varieties and they are very inexpensive. Stock up on Coconut Milk there as well. Enjoy!